For some reason I never thought that a pie plate would be a key kitchen item to register for before our wedding almost two years ago. I was wrong. Ya’ll, the number of times I’ve wished I owned one can be counted on more than two hands. And yet, even though Pyrex pie plates cost all of ten bucks at Kroger, I’ve never gotten one. I’ve used every alternative under the sun for my cakes, pies, and quiches- from cake pans to disposable foil pie plates- and dealt with everything from burning crusts to overflowing eggy messes in the bottom of my oven. I guess I’ve been holding out hope for someone to give me a real pie plate as a gift one day… (hint hint). My hinting apparently worked, because that day finally came! I received the cutest fall-themed package when my parents came down to visit Durham a few weeks ago, filled with yummy snacks, yellow and orange-leafed garlands for our mantel, little squash decorations, and best of all- this sweet ceramic pie dish! 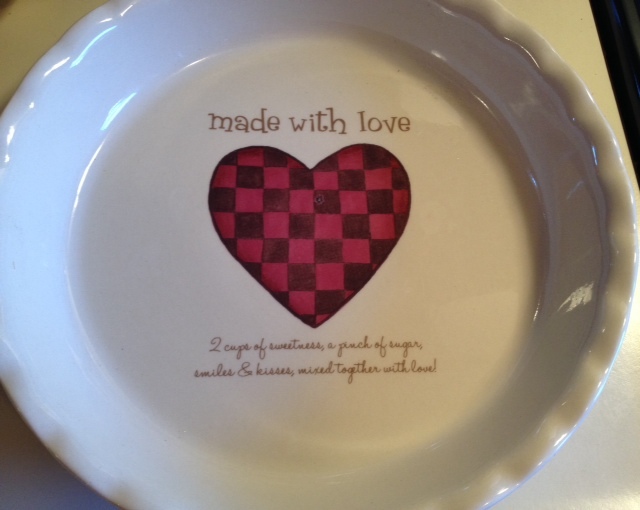 I love how it says “Made With Love” at the bottom with a country-style heart and a note that says “2 cups of sweetness, a pinch of sugar, smiles & kisses, mixed together with love!” My mother would catch her eye on something like this. Like mother, like daughter. I think it’s absolutely adorable. I had to inaugurate it into my baking dish collection. But what to choose from my growing list of apple pie and cobbler recipes to try out? I decided on a quiche, because it reminds me of my mom. Apparently, after her wedding, the only thing she knew how to make was quiche, and so she made it for my dad every night for a month until he had to beg her one night to get Chinese take-out. So the story goes. 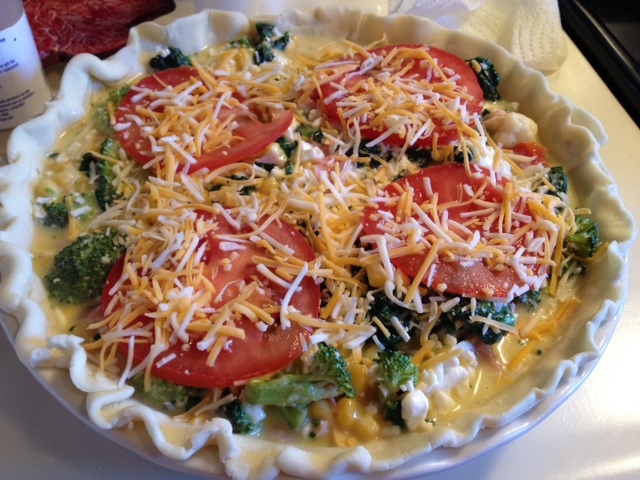 Anyway, I decided on this half made-up recipe for a veggie quiche with corn, tomatoes, spinach, broccoli, cauliflower, and leftover scraps of ham. I also added some cottage cheese since that’s the way Mom always makes it! Throw in some shredded cheese, stick it in the oven and an hour later enjoy the results! Easiest recipe ever! Not to mention a GREAT way to use up leftover scraps of vegetables and cold cuts. 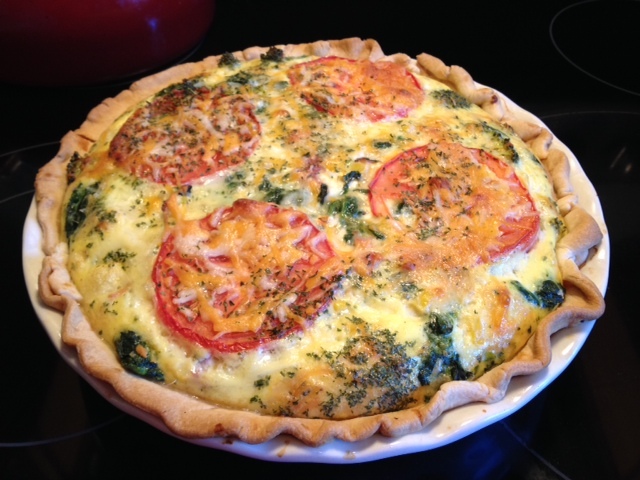 Easy quiche recipe to use up all those scraps of leftover veggies and cold cuts that are taking up precious room in your fridge! Easy enough for a weeknight dinner with lots of leftovers for lunch the next day! Unroll pie crust and place in a oiled pie plate, pressing down firmly into plate and cutting away excess crust along the top. In a large bowl, beat together eggs, milk, cottage cheese, frozen spinach, corn, broccoli/cauliflower, ham, and half of the shredded cheese. Add spices and mix thoroughly. Pour into prepared pie crust and place sliced tomatoes on top of mixture. Sprinkle the rest of the shredded cheese over the top. Pinch edges of pie crust around edges for that classic scalloped look. Bake at 375 deg for 45-55 minutes, until a fork inserted into the center comes out clean. It may appear a little liquidy when you first take it out! Cool for at least 10 minutes to allow quiche to set! Serve with a salad on the side.